“If you want to see how 100% renewable energy has been put into practice in the field, please take a look yourself in my village in Sumba, Indonesia. Everyone who comes today is welcome”, said Umbu Janji. He made his invitation to the appreciative laughter and applause of participants at the international conference “100% Renewable Energy for 1.5 Degrees” at COP22 in Morocco, last week. 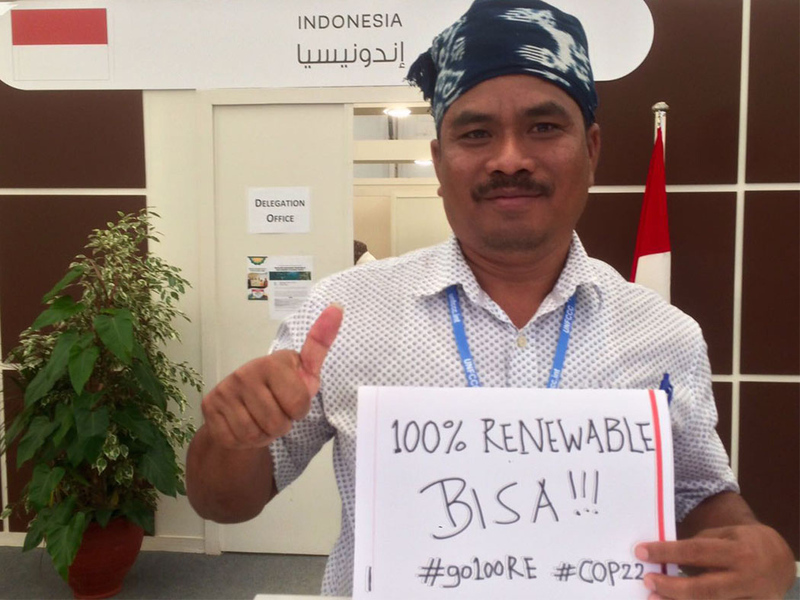 Umbu Janji, a member of parliament in Sumba, attended the COP22 summit as the speaker representing his community in Kamanggih village, East Sumba. Renewable energy projects that emphasize on off-grid methods, such as SII, are able to run well thanks to the involvement of all stakeholders. “This project will succeed if all stakeholders, such as the local community, government, non-profit organizations and the private sector play a role. If the community is also trained to manage the facility, they will have a high sense of responsibility and will take good care of it”, said Umbu Janji. To stress the urgency for all stakeholders action, the countries gathered in Marrakech released the Marrakech Action Proclamation that underlines the need for funds to go to the most vulnerable countries and to link climate finance with poverty eradication. “100% renewable energy is not only a dream; it will come true. I’m seeing it already and using it myself on my island”, Umbu Janji finished with a flourish.